A terrible tragedy is unfolding as I write this. Notre-Dame de Paris is on fire and at the time of this writing, the iconic spire has just collapsed in the blaze. I haven’t heard any news regarding loss of life, so hopefully everyone is safe. It is already apparent, however, that the loss of history and artifacts in this building will be significant, if not total. 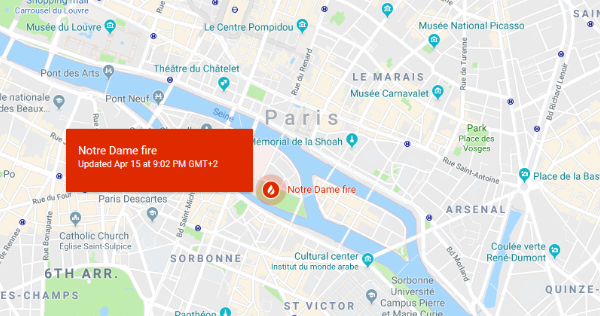 In searching for information about Notre-Dame Cathedral, I immediately noticed several features in Google Search and Google Maps that I hadn’t seen before, primarily because they only appear during active events such as this. I realize at moments such as these, no one is thinking “How’s Google responding to this?” but I thought I would document some of what I’m seeing across Google and other websites in real time to show some of these features at work. When I look for something on Google Maps, I typically try to find it by panning around and zooming in and out on my own without searching specifically for it; it’s just a personal habit that helps me learn locations better. 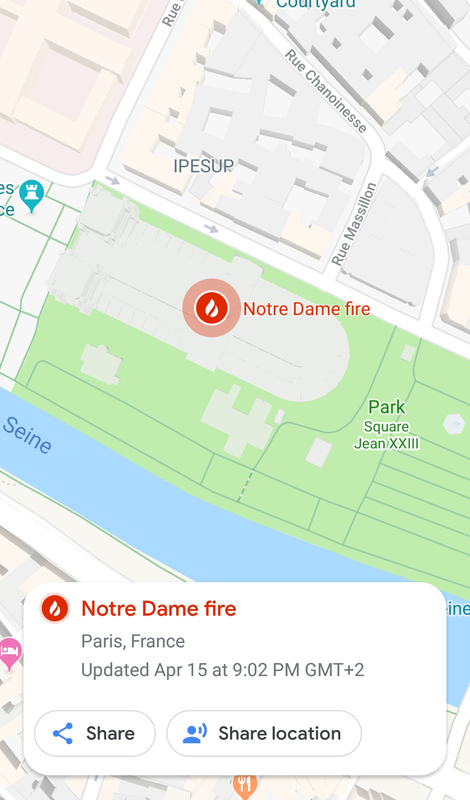 Having never visited Paris before, I zeroed in on the city and as the image above shows, a flame icon with “Notre Dame fire” appeared right where I was headed. Hovering over it showed the last updated time, and on mobile I was given the option to share or share my location. 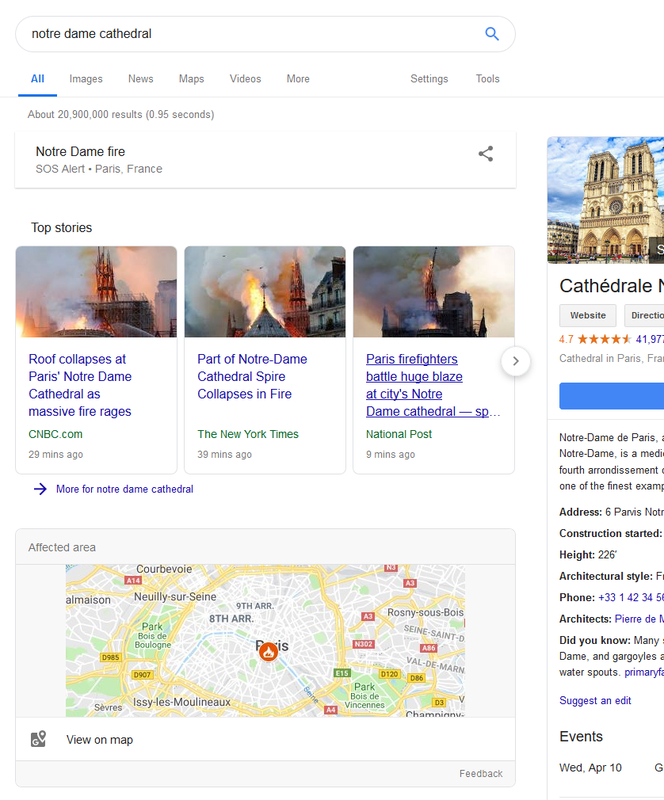 I hopped over to Google Search, and saw that when I searched [notre dame cathedral], an SOS alert was at the top of the results with a share option. Beneath the Top Stories tiles was a map snippet I haven’t seen before for “Affected area.” This highlighted a portion of the map, again with the flame icon in the location of the cathedral. I’ve known of similar features for ongoing nature disasters, but I’m not aware of isolated events such as this prompting these results. This could be because the fire of course has the potential to spread, which would make it trigger the same features as wildfires. On other fronts, there is already a Wikipedia page on the Notre-Dame de Paris fire, of course, and the main page for the cathedral has a section on the 2019 fire. I will leave you with an encouraging note. 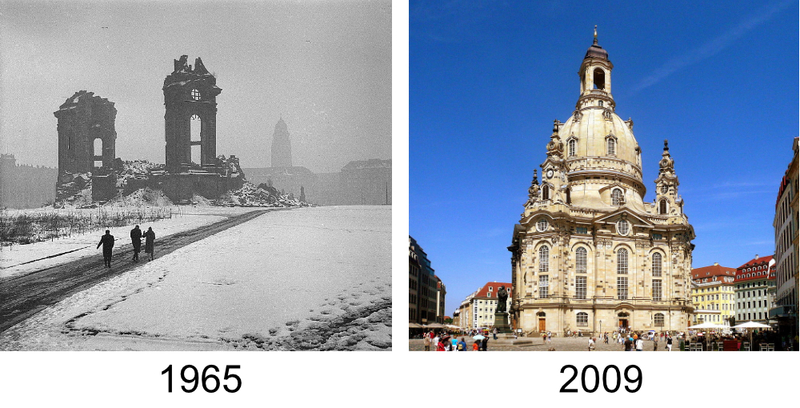 I saw someone on reddit point out how the Dresden Frauenkirche was once completely destroyed during WWII, left in ruins for 50 years, and then meticulously rebuilt using original plans on modern technology from 1994-2005. Notre-Dame de Paris is one of the most photographed buildings in the world, and thanks to recent technological advancements it has been 3D scanned, modeled, photographed in 360°, and endlessly studied. While many artifacts will be tragically lost, we can remain hopeful that the building can be brought back to life. Again, all of this is ongoing and we’re all hoping that as much of the building can be saved as possible. As I sit here 4,000 miles away, as helpless as I would be from one mile away, I just thought I’d capture some of these ways in which Google is displaying and communicating active disasters. If you have any information on these features or other examples, I would love to hear about them.